Ce document au format PDF 1.6 a été généré par Co-Action / Acrobat Distiller 9.0.0 (Windows), et a été envoyé sur fichier-pdf.fr le 28/09/2013 à 21:53, depuis l'adresse IP 212.195.x.x. La présente page de téléchargement du fichier a été vue 566 fois. Taille du document: 185 Ko (7 pages). including arousal, cognitive ability, and neuroticism. later, they were retested, and completed a questionnaire about events on deployment. 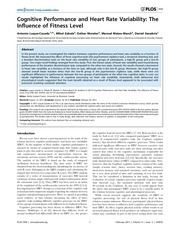 higher susceptibility to the misinformation effect. encoding the information and more related experiences. in the film, even though no broken glass had been shown. distribution, and reproduction in any medium, provided the original work is properly cited. Miriam J. J. Lommen et al. psychology (see Zaragoza, Belli, &amp; Payment, 2006). or a newspaper; Johnson, Hashtroudi, &amp; Lindsay, 1993). how the plane hit the building and what happened next. images that interfere with source monitoring. retested and some still showed the misinformation effect. positively correlated with susceptibility to the misinformation effect (Gudjonsson, 1983; Liebman et al., 2002). these variables, they should be included in one study. been exposed to similar events there. The misinformation related to a fictional deployment-related stressor. about vulnerability and resilience factors in risk for PTSD. were single. About 43% had not been deployed before. that included assessment of deployment-related stressors. about a missile attack at the base on New Year’s Eve. For recruitment details see Lommen et al. (2013). reliable measure (Engelhard et al., 2007; Foa et al., 1993). number of correct answers was computed (range 0 60). items that can be answered with yes ( 1) or no ( 0). scale are good (Sanderman et al., 1991). had experienced the missile attack on New Year’s Eve. Snell R2 and McFadden R2) to 18% (Nagelkerke R2). with each point of increase on the Raven. for low PSS-H scores was hardly affected by PTES scores. effect when arousal was low. which suggested an absence of selection bias. (n 25), x2 4.30, df 1, p .04.
variable Raven (no 134, yes 42). plausibility and visual processing of the information. 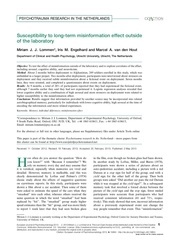 ability affect susceptibility for the misinformation effect. lines representing the percentiles of PSS-H, and the probability of the misinformation effect at the Y-axis. time of encoding the misinformation was not included. arousal and lasting declarative memory. Trends in Neurosciences, 21, 294 299. Crombag, H. F. M., Wagenaar, W. A., &amp; van Koppen, P. J. (1996). Crashing memories and the problem of ‘‘source monitoring’’. Applied Cognitive Psychology, 10, 95 104. Engelhard, I. M., van den Hout, M. A., &amp; McNally, R. J. (2008). deployed to Iraq. Memory, 16, 3 9. Foa, E. B., Riggs, D. S., Dancu, C. V., &amp; Rothbaum, B. O. (1993). creation of false childhood memories. Memory, 6, 1 20.
memory. Clinical Psychology Review, 18, 933 947.
film. 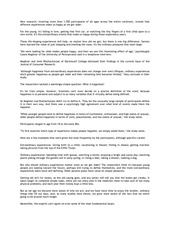 Applied Cognitive Psychology, 20, 591 596.
monitoring. Psychological Bulletin, 114, 3 28.
longitudinal prediction model. Journal of Abnormal Psychology, 109, 624 633. Liebman, J. I., McKinley-Pace, M. J., Leonard, A. M., Sheesley, L.
suggestibility. Personality and Individual Differences, 33, 49 66. Lindsay, D. S., Hagen, L., Read, J. D., Wade, K. A., &amp; Garry, M.
Loftus, E. F. (1975). Leading questions and the eyewitness report. Cognitive Psychology, 7, 560 572.
memories. Psychiatric Annals, 25, 720 725.
differences in extinction learning predict posttraumatic stress. Behaviour Research and Therapy, 51, 63 67.
of mental health response. Military Medicine, 169, 198 206.
plausibility goes a long way. 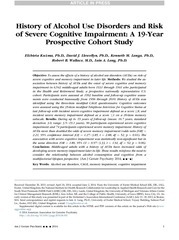 Journal of Experimental Psychology: Applied, 7, 51 59.
against memory impairment hypotheses. Journal of Experimental Psychology: General, 114, 1 16. Otgaar, H., Candel, I., Merckelback, H., &amp; Wade, K. A. (2009). Cognitive Psychology, 23, 115 125.
analysis of false recognition. The American Journal of Psychology, 120, 429 458.
inventory and state-trait anger expression inventory. In M. E.
traumatic events in veterans of operation Desert Storm. American Journal of Psychiatry, 154, 173 177.
inflation effect. Memory &amp; Cognition, 31, 630 640. Zhu, B., Chen, C., Loftus, E. F., He, Q., Chen, C., Lei, X., et al. false memories. 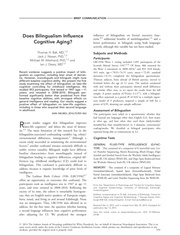 Applied Cognitive Psychology, 26, 301 307. Zhu, B., Chen, C., Loftus, E. F., Lin, C., He, Q., Chen, C., et al. (2010a). Individual differences in false memory from misinformation: Cognitive factors. Memory, 18, 543 555. Ce fichier a été mis en ligne par un utilisateur du site. Identifiant unique du document: 00194118.